I had thought that my first film of the year would be Avatar, which according to BBC World this morning is the fastest grossing film of all time (thanks to the additional expense of those 3-D glasses, no doubt). But Zee had to pop over to Chiang Mai's mall, the Central Airport Plaza, to get her Macbook fixed and so we decided to catch a movie. 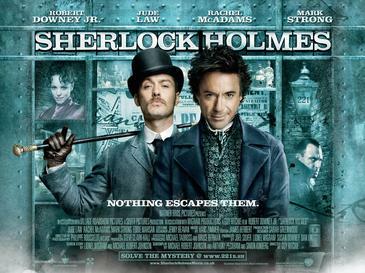 I didn't fancy Avatar with Thai subtitles so instead we saw Guy Ritchie's new version of the Sherlock Holmes story. And boy, is it definitely a Guy Ritchie film. It's as though the man simply couldn't resist the chance to include a bare knuckle fight somewhere within the otherwise convoluted and frankly daft plot. After stopping the sinister Lord Blackwood from committing a ritual killing, Sherlock Holmes is bored and restless, with no new case to investigate and the imminent engagement and departure from Baker Street of his friend and chronicler Dr Watson. But Blackwood appears to return from the grave following his execution. Taking up the case, Holmes is drawn into a plot involving an occult secret society, former adversary Irene Adler (an under-written Rachel McAdams) and a series of new murders. After the embarrassment of practically every film Ritchie has made since Lock Stock, the real surprise was that it is actually quite good. Unlike previous actors, Robert Downey Jr in the title role portrays Holmes as he is described by Conan Doyle in the early books, as an eccentric bohemian, with little regard for tidiness, personal hygiene or his financial situation. The relationship between him and Watson, as played by Jude Law, displays a genuine fondness that is both believable and at times very funny. Mark Strong, one of the best character actors there is, makes a menacing if somewhat ludicrous villain as Lord Blackwood and the prospect of a franchise is established with the introduction of an (unseen) Professor Moriarty. Even the set pieces are enjoyable, the half-competed Tower Bridge was a nice touch and the contemporary nod to terrorism and the manipulation of the public through fear was understated..
None of it really makes any sense, of course. There is rather too many strands to pull together at the end and Ritchie still couldn't write female characters if his life depended on it. But in the hands of a director who has such a poor track record, it really could have been so much worse. Getting Downey Jr to act largely without mumbling probably deserves a award nomination in itself. "Ritchie still couldn't write female characters if his life depended on it." I am gonna see Nowhere Boy just cos I am interested in Sam Taylor-Wood's directorial debut (not a fan of her art).